When it comes to traveling in a RV, space is often at a premium, but that doesn’t mean you need to sacrifice comfort or style. 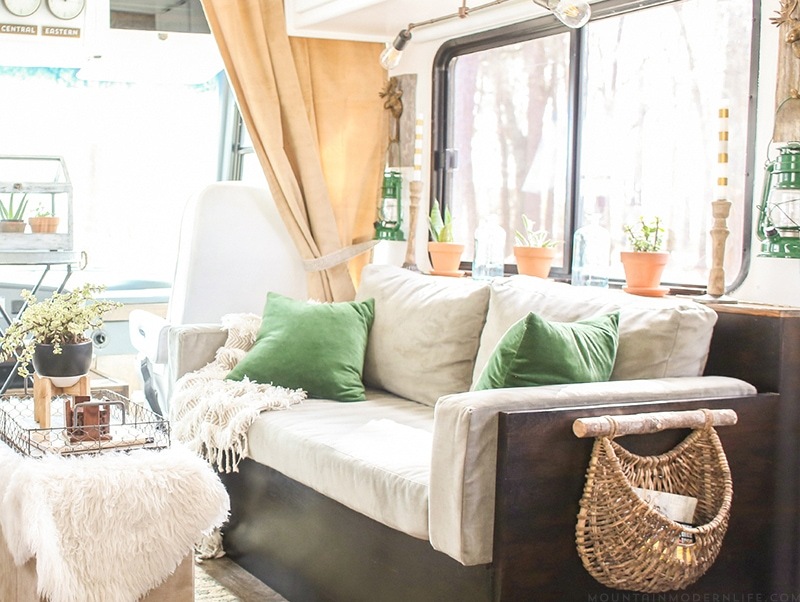 Here are 4 ways to maximize the footprint of a tiny space, whether it’s on wheels or not. Think about how one piece of furniture can serve more than one purpose and you’ll be on your way to creating more with less. 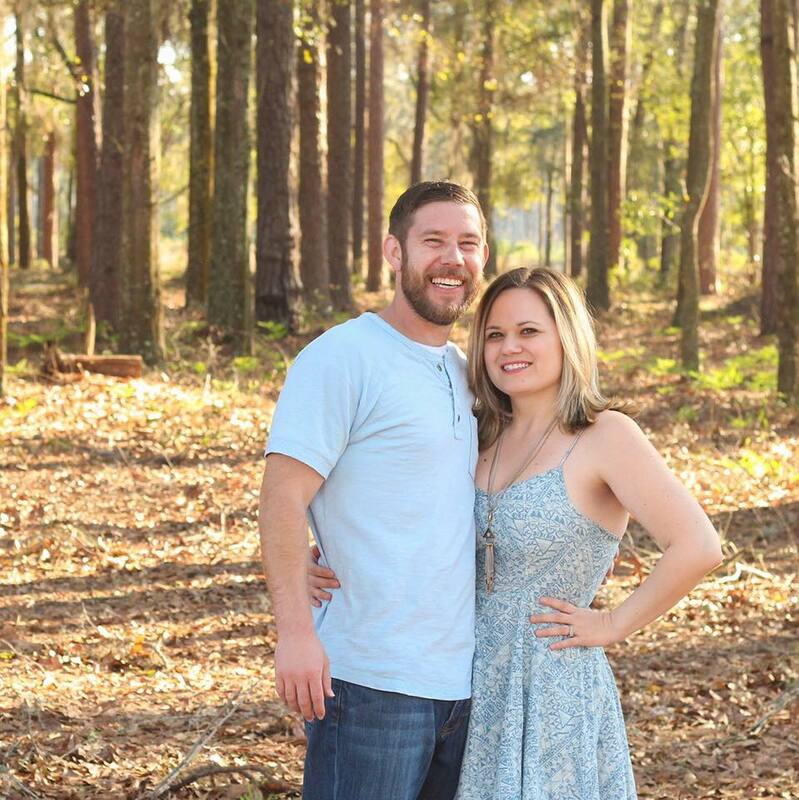 For our RV, we built a custom media cabinet with storage, an electric fireplace, and installed our TV on a lift so it can be hidden when not in use. We also used heavy duty extension slides to create a drawer that easily transforms into a dining table or desk in a matter of minutes, yet it can be tucked neatly away when not in use. Baskets are a great way to add both function and design to a tiny space. We have a basket hanging on the side of our sofa that we use to store small games, leashes, and the TV remote. Another basket hangs on the wall near our media cabinet that holds smaller remotes for our LED candles, fireplace, and TV lift. This way we can easily access the items we use often, but they can be tucked away in their own spot, which helps keep clutter at bay. 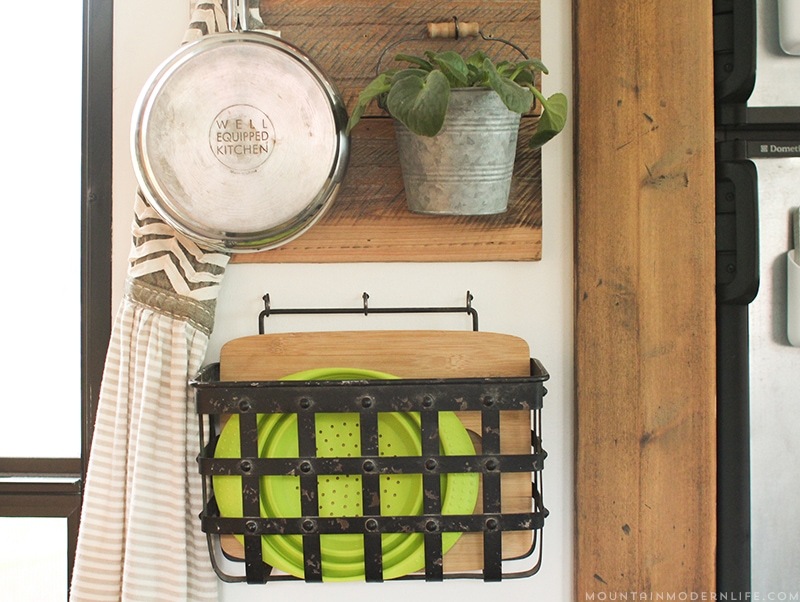 Another way we’ve saved space in our tiny home on wheels is with collapsible solutions, such as the colander you see in the image below that hangs in…. a basket. Yes, we love baskets around here, can you tell? Not only does this collapsible colander do its job when needed, but it folds flat for easy storage when not in use. You’d be amazed at the number of products available that can easily collapse, including bowls, buckets, bins, tables, drying racks, and ottomans. As a matter of fact, the ottomans we use for our coffee table can be used for storage, extra seating, or be folded flat. 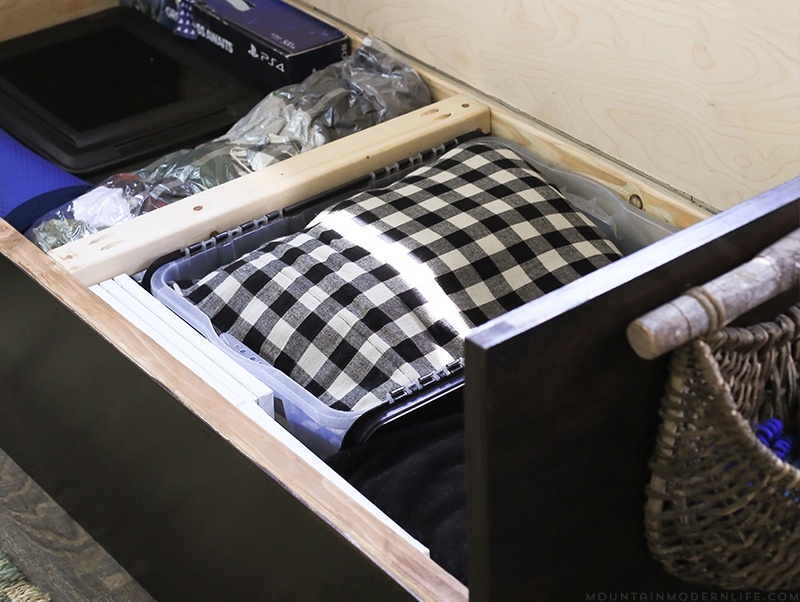 Tiny homes generally come with tiny closets, but that doesn’t mean you can’t find a place to store seasonal items. You can find beds with hidden storage underneath, ottomans like the ones we use in our living room, or you can purchase or build furniture with additional built-in storage. This is what we did for the sofa in our RV. We use this space for items we rarely use, or only need occasionally, such as heavier blankets, extra light bulbs, or our winter clothes that we keep in a vacuum sealed bag. 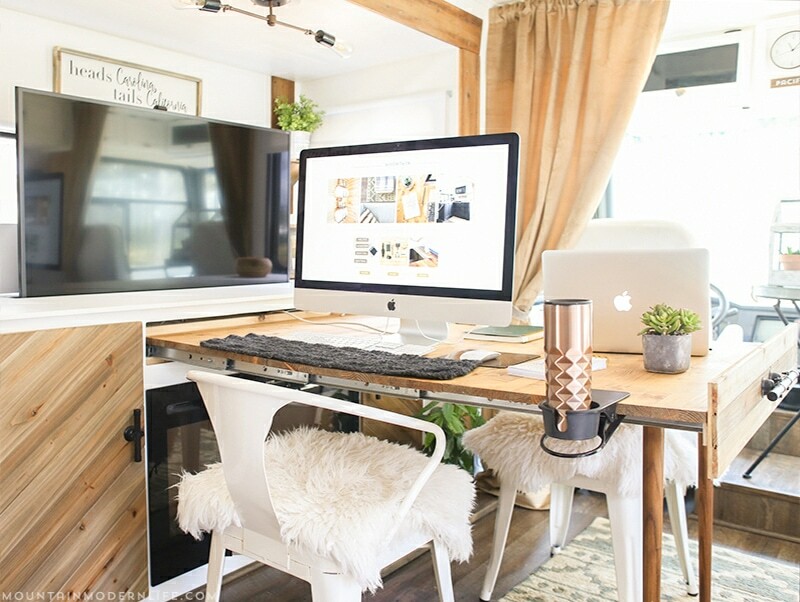 I hope these tips show you that challenges can often ignite creative solutions, and with a little bit of planning you can live big, even in a tiny space.